I am a huge proponent of enjoying the small details in the places around you, and making your every day life into an adventure. Dave and I have lived in a few cities in the past few years, and our future looks like it is going to follow that same path. We have enjoyed our time so much getting to explore Norfolk and soak in all the unique things she has to offer. Though it is a (very) late start, I wanted to just document this place a little better. Who knows where the next few years may bring us, and then we will have a whole new place to explore! One of the things that makes Norfolk unique is it's tie to the water. It is a major shipping port, and houses the largest Naval Base in the world. It seems like every part of life here is tied to the sea (which in this case is the Chesapeake Bay). The food, people's jobs, how houses are built. It makes sense that the culture would celebrate the sea as well. One of the ways Norfolk celebrates the sea every day is with mermaids. Recently, I posted a photo on Instagram of a little mermaid with a caption that read something like "because Norfolk is famous for mermaids!" Someone asked me a question about why Norfolk was famous for mermaids... and I actually had to look it up to answer her. They are such a part of the culture here, that I just accept and love them at every turn. The mermaids were one of the first things that I noticed about Norfolk when I moved here. Honestly, it is hard not to notice them. They are on every neighborhood sign, businesses sign, at the airport, and even on parade! 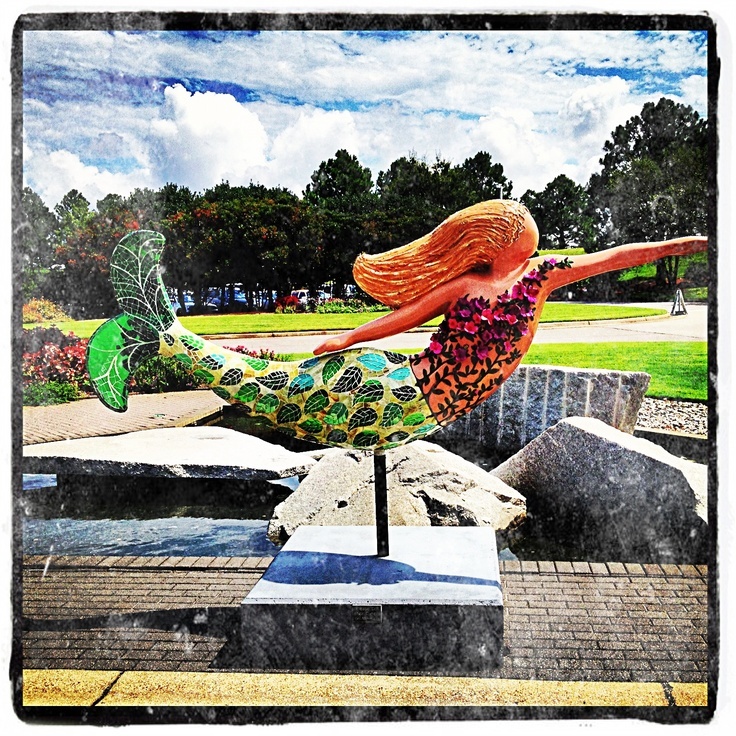 When the mermaid was adopted as Norfolk's symbol 10 years ago, her job was to polish the city's image, and to be a representation of the city's nautical heritage. It became extremely popular, with several other cities in the area following suit with their own city symbols. Local businesses "adopted" mermaid statues which were then decorated by local artists and then auctioned off. Today they can be seen around the community, and loved by residents and tourists. Visit Norfolk, our local tourism group, has a Pinterest Board where you can see some additional mermaid statues. The one below is located at the botanical gardens. The mermaid's popularity shows no sign of waning in Norfolk. We just had our annual Harborfest, which also celebrates the nautical heritage and there were mermaids galore! You can also find merchandise with a mermaid on it at just about any store in the downtown area. Dave and I have lived here for two years now that it's June, and all I have to say is that time FLIES. We are enjoying our time in Norfolk, but I plan to take full advantage of every second that we have left. Because who knows where we will be in the next year or two? Have you been bitten by the travel bug? What are some of the things that make your city unique? What do you love about it? Well, I just learned something new. Thanks! How wonderful to live in a place where you're surrounded by mermaids. What a very cool idea.